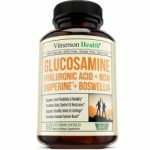 What is Vimerson Health Glucosamine? Vimerson Health Glucosamine is all-natural, GMO-free, gluten-free and dairy-free joint health supplement made only with non-shellfish-based glucosamine. The formula is infused with naturally-derived ingredients that add to the restorative and protective functions of this supplement to the joints and cartilage. Regular supplementation has been claimed by this product’s manufacturer to lead to stronger joint structures, enhanced energy levels and repair mechanisms, and increased immune functions. The formula also promotes healthier bones and muscles which, in turn, help joints stay stronger and more resilient to future damage. Who is the Manufacturer of Vimerson Health Glucosamine? Vimerson Health is the company behind the manufacturing and distribution of this supplement. The company boasts of a wide range of dietary supplements and other nutritional products that cater to almost every known ailment or nutrient deficiency with key ingredients to keep the body functioning at an optimal level. How Does Vimerson Health Glucosamine Work? This supplement works by delivering multiple benefits to the body that promote joint healing and protection. The formula works with your body’s natural mechanisms for immune response to promote greater comfort, flexibility and range of motion. It supports the formation of structures, ligaments and cartilage that solidify the joints and improve lubrication. Vimerson Health Glucosamine Ingredients – Are they Safe & Effective? Glucosamine: This ingredient interacts with your body’s natural immune response which results in greater joint recovery from damage and deterioration, comfort in movement, and improved range of motion. Chondroitin: This component promotes greater joint lubrication which leads to increased flexibility, giving you a feeling of comfort, pain relief, and improved protection from future damage. Turmeric: This natural ingredient contains powerful anti-inflammatory and antioxidant components that support rapid relief from pain as well as improved protection from future joint aging and deterioration. MSM: This ingredient enhances your body’s natural production of collagen so that healthy joint and bone structures are maintained. It also promotes stronger muscle fibers that also contribute to keeping joints intact and well-protected from injury. Boswellia Extract: This ingredient improves joint lubrication and moisture retention capabilities, alleviating friction that eventually leads to bone and joint damage. Bromelain: It relieves joint pain and swelling, providing you with enhanced comfort and ease of movement. Quercetin: It has natural antioxidant and anti-inflammatory properties that help alleviate pain caused by inflammation and supports protection of your joints from future signs of damage and deterioration. What are the Advantages of Vimerson Health Glucosamine? Unlike most joint supplements that use glucosamine and chondroitin as its active ingredients, this supplement combines these with antioxidants and natural extracts that boost its joint health benefits. This product does not contain GMOs and uses only natural, non-dairy and gluten-free sources. The formula contains Bioperine which helps with faster absorption by the body and enhances the bioavailability of this product to promote more immediate use by the body in fueling mechanisms for joint repair. What are the Disadvantages of Vimerson Health Glucosamine? This product is intended for the use of adults only. Positive results are not immediate and are not guaranteed. Like any other supplement, there is a strong possibility for this product to react with your other supplements and medications. How Should You take Vimerson Health Glucosamine? Take one capsule daily before each meal, totaling 3 capsules daily intake only. The manufacturer recommends taking a double dose, or 2 capsules, with every meal for the first two weeks of supplementing with this product. How Much Does Vimerson Health Glucosamine Cost? Every 90 capsule, 30-day supply, bottle of this supplement sells for $28.91 on the manufacturer’s online store, currently discounted at $23.87. Cheaper options are available when purchased from online reseller websites. What is Vimerson Health Glucosamine’s Return Policy? Supplements bought via the manufacturer’s online store are covered by a risk-free, 100% money back guarantee. The manufacturer does not specify any allowed timeframe for refunding returned products, however. Does Vimerson Health Glucosamine Offer a Free Trial? This supplement does not appear to be available via a free trial offer. Vimerson Health Glucosamine is an average joint pain supplement that contains many of the ingredients one would expect to see in this type of product. It is appreciated that there is a 100% money back guarantee but knowing the terms and conditions of the offer would be helpful. The only aspect of this product that makes it stand out in any way is the addition of quercetin, turmeric and bromelain to the formula. Not all joint pain supplements contain these and, in addition to providing antioxidant protection, they may help the user experience relief faster than they might with a different brand, especially when taken at the initial double dose suggested by the manufacturer.